On April 1, 2009, Royal City Rag was broadcast live from an unlikely Guelph location. 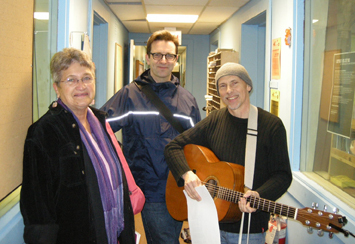 The show featured storytellers Sya Van Guest and Brad Woods, and singer-songwriter Sam Turton. Special thanks are due to the management of the establishment for allowing us to broadcast the show and all the people who came by to listen and join in the fun. Thanks also to Bubble the Clown for joining us to keep the children entertained. I strongly recommend you check out the show if you get the chance. Sya and Brad’s stories were wonderful, a joy to listen to. Sam is well-known for preparing many different versions of our musical theme, Nick Lowe’s “What’s So Funny About Peace and Understanding?”; this time he used a lounge-style. He also composed a new song, “April Fool”, especially for the show! I hope you enjoy listening to the show as much as we enjoyed putting it together. A perfect show for a very special day. Catch Royal City Rag, Saturdays 7-9 a.m. on CFRU93.3fm, Guelph’s Campus-Community Radio Station. We started Royal City Rag on March 27 with a gorgeous three song set featuring two bluesgrass numbers from Del McCoury and a beautiful love song “That Time Of the Night” from English singer-songwriter, Michael Chapman. In the first hour of the show we talked to Rachel Shoup and Catherine Norman from Storytelling For Social Change, a Guelph student group, who have a special event, “Roots of Change” on April 1 from 6 – 11 p.m. in the Ed Video Gallery, 40 Baker St, Downtown Guelph. At the event, four local activists from the campus and local community will share their stories of change and activism, followed by a discussion period. Opening the event will be acoustic guitarist/singer-songwriter David Scott. During his set he will be performing “Red and White on Rope”, a song he wrote as a creative response to reading Dr. Anne-Marie Zadjlik’s journals regarding the Bracelet of Hope campaign. The evening is free by donation to support the “Roots of Change” project. Complimentary beverages and food will be provided. There will also be an open mic portion of the program for people to share their own stories of activism through creative expression. The event will be recorded for broadcast on CFRU93.3fm. RSVP to this event via Facebook here. In the second hour of the show, Royal City Rag went out on the road for an historic excursion to St Jacob’s Farmers Market with storytellers Sya Van Guest and Brad Woods and singer-songwriter Sam Turton. Our trip was made possible by CFRU 93.3fm’s super duper new mobile studio located in the back of a specially modified school bus. Not only will this new technology allow us to do more outside broadcasts of the show but for today’s journey we were actually able to broadcast while we were driving along. It’s well worth a listen, even if I’m clearly biased. Enjoy! 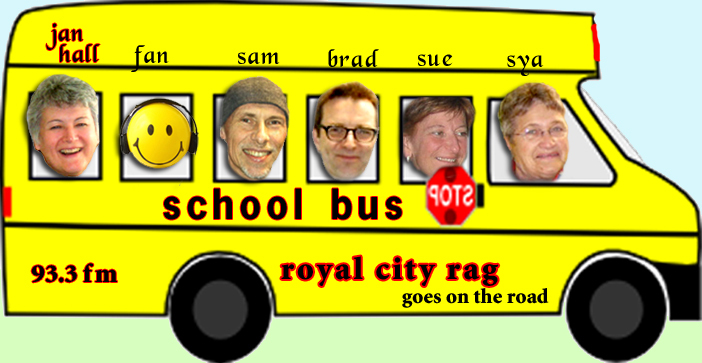 Coming Up On Royal City Rag – We’re On The Road! Royal City Rag will be (literally) broadcasting from the road this coming Saturday, March 27 between 8-9 a.m.
We’ll be the first CFRU show to make use of the radio station’s new mobile studio as we travel by road from Guelph to St Jacob’s for a storytelling event. Not only will the studio allow us to be location much more from now on but with this new technology we can actually broadcast on route while we’re driving along. We’ll be travelling in a specially equipped school bus with CFRU 93.3fm and Royal City Rag emblazoned on the side. We’ll be hard to miss so do look out for us as we travel down Victoria Road, through downtown, and out via Edinburgh Road North and Woodlawn Road to Hwy 7. Joining us on this historic excursion will be storytellers Sya Van Guest and Brad Woods and singer-songwriter Sam Turton. In the first hour we’ll have our usual mix of cool music, events listing and an interview with the organisers of Roots of Change: Storytelling for Social Change taking place at Ed Video, 40 Baker St, Downtown Guelph on April 1. It all promises to be lots of fun. You won’t want to miss it! We had a very special 3-hour version of Royal City Rag on CFRU93.3fm on February 13 to celebrate St Valentine’s Day. We started out the show with a new single from Johnny Cash (really), “Ain’t No Grave”, the title song from American Recordings 6 to be released on February 23. I’m not sure how I feel about another posthumous Johnny Cash album. I’m a big fan, but he sounds very frail on this release. It will be interesting to see what the rest of the album sounds like. We followed that with Peter Gabriel and his version of Bon Iver’s Flume from the very interesting “Scratch My Back” covers album featuring songs by Radiohead, Randy Newman and Elbow alongside Bon Iver and others. A soon to be released companion album will have the ‘covered’ artists interpreting Gabriel’s work. You have to admit its a nice idea. The early reviews are very favourable so I guess I’ll be picking up this one too. 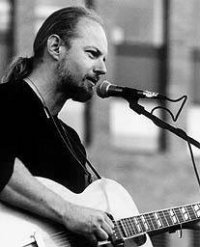 And finally, to round out the first set we listened to a gorgeous song by Garnet Rogers, “Summer Lightning” from the live set, Get A Wtiness. Garnet is in Guelph on February 19 for a show at Dublin St United. Should be a great gig. All the details are here, if you need them. 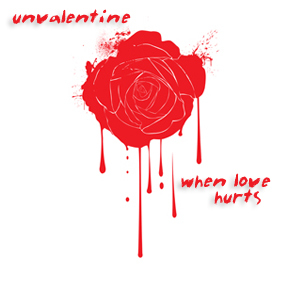 Later in the hour, we dipped into the Valentine’s theme again, with one of my favourite love songs, Joan Armatrading’s “Willow” and followed that with the beautiful but sad “If love were the cure” from Guelph’s Detour. Detour are 16 year old Elivia Cazzola and her 14 year old sister, Anita. Detour were on last year’s yuletide Royal City Rag playing some traditional songs. We’re hoping to have them back on Royal City Rag fairly shortly, this time focusing on their own material. Stay tuned. To wrap up the first hour Simon Irving, Artistic Director of the Guelph Symphony Orchestra joined us to chat about the GSO’s Valentine’s Day concert at the River Run Centre, Music Of Love and Romance. The performance features some of the most romantic music ever written including Mozart’s Elvira Madigan Concerto and the Warsaw Concerto, as well as favourite tunes from South Pacific, and songs by Sigmund Romberg. Interpretive dance to Prokoviev’s Romeo and Juliet featuring Clayton Scott makes this a concert not to be missed. Tickets are selling out fast, so if you still want to go, and, remember, it is Valentine’s… Call the River Run Box Office at 519-763-3000 or go Online to secure a Valentine’s Day to remember. In the second hour, we celebrated Valentine’s weekend in spokenword and music with storytellers Sya Van Geest and Brad Woods and singer-songwriter Sam Turton. We had planned to be on location in Niagara Falls, but after it turned out that, according to the Guelph Mercury, Guelph is the most romantic city in Ontario, we hastily recast our plans and headed down to the Farmers Market. Unfortunately no one told Brad so he ended up in Niagara Falls! Fortunately hs still managed to deliver his story. Good fun was had by all even if it was a bit on the chilly side in the Farmers market car park. And finally, to finish a bumper edition of Royal City Rag, we welcomed Sheila O’Reilly (host of CFRU’s A Dog’s Breakfast) and writer and educator Susan Wheeler into the studio for a Valentine’s Weekend song share. An opportunity to hear some great tunes, we very democratically shared some of our favourite love songs, some sad, some happy and some I’d not thought of playing to celebrate the holiday. We finished up the hour with the Korgis (Stackridge’s Andy Davis and James Warren) beautiful “Everybody’s Got To Learn Sometime” followed by George Adams and Don Pullen’s “God Has Smiled At Me”. A gorgeous way to finish the show, and, well worth listening to… just for that! I hope you enjoy it. All in all, a great show… and almost too much to have to tell you about! I’d suggest that you just take a listen yourselves. You’ll not be disappointed. Coming Up On Royal City Rag… A Bumper Valentine’s Weekend Edition! We have a ‘bumper’ edition of Royal City Rag planned for February 13. In the first hour (7-8 a.m.) we’ll talk to Simon Irving, Artistic Director of the Guelph Symphony Orchestra about their Valentine’s Day concert at the River Run Centre, Music Of Love and Romance, featuring some of the most romantic music ever written – Mozart’s Elvira Madigan Concerto, the Warsaw Concerto, both works featuring their own Amy Wark as piano soloist, as well as favourite tunes from South Pacific, and songs by Sigmund Romberg, performed by soprano Mary DuQuesnay. The timeless story of Romeo and Juliet will also be presented and interpreted by the magnetic Clayton Scott, with thrilling and emotional music by Prokofiev. Guest conductor for Romeo and Juliet will be Judith Yan of the National Ballet. When: Sunday February 14 at 3.00 p.m. In the second hour (8-9 a.m.), we’ll be celebrating Valentine’s weekend in spokenword and music with our good friends, storytellers Sya Van Geest and Brad Woods and singer-songwriter Sam Turton. It promises to be great fun. You won’t want to miss it! 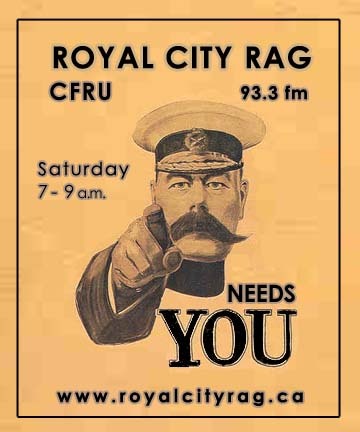 Royal City Rag, Saturdays from 7-9 a.m. on CFRU 93.3 fm, Guelph’s Campus and Community Radio Station. Listen live on CFRU 93.3fm, or, after the fact, via the website. If it happens in Guelph you’ll hear about it on Royal City Rag! Sam Turton and Jane Lewis are bringing their community singalong to Guelph east side restaurant, Ashuré’s, on a monthly basis from now on. They kick off a new year of community singing on January 16 from 8.00 till 10.00 p.m. The evening will feature a feast of well-known songs and to celebrate their new home, a selection of prizes including CDs, and gift certificates. As well as monthly singalongs, Ashuré’s also offer other forms of live music on the weekend. Norman Liota, Mo’ Kauffey, Max Bent, Corduroy Road and Rodney Jewel are all scheduled to appear over the coming weeks. 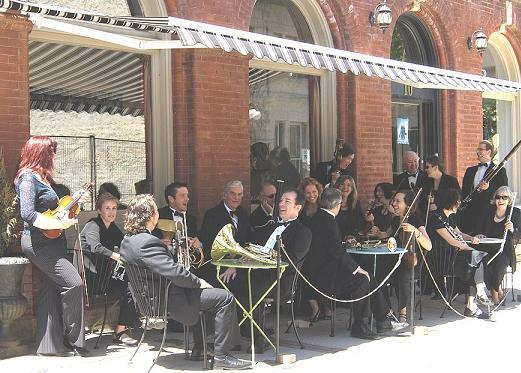 Ashuré’s wants to become a community-friendly destination that supports the arts and home-made food. For dinner on the night of the singalong, call 519-515-0522 for reservations. Sam Turton and Jane Lewis Community Singalong Prize Night—a free, all-ages event, from 8 -10 p.m. Saturday, January 16, at Ashuré’s, 259 Grange Road, Unit 6, in Guelph (at Victoria & Grange). Sam and Jane will also be having a singalong at The Woolwich Arms on Sunday, January 24 at 8.00 p.m.